I recently finished reading, “Living with a SEAL: 31 Days Training with the Toughest Man on the Planet.” It’s a hilarious book about two men from different worlds living together for a month (read my takeaways from the book here). In the book, Jesse Itzler, a successful entrepreneur, feels his life has become to comfortable and stagnant so he asks a Navy SEAL to live with him and train him for 31 days. That “SEAL” by the way, is David Goggins, one of the toughest men on the planet. Why is Goggins considered one of the toughest men on the planet? He is the only person to complete SEAL training (3 Hell Weeks) U.S. Army Ranger School, and Air Force Tactical Air Controller training. He has competed in more than sixty ultra-marathons, triathlons, and ultra-triathlons. He broke the Guinness World Record by completing 4,030 pull-ups in 17 hours. And those are just a few of his accomplishments (I highly recommend reading his book, “Can’t Hurt Me” to get the full story). For a month, Goggins made Itzler do countless crazy workouts: hundreds of burpees and push-ups, running for miles in the snow, you name it, they probably did it. Do you think you’d be able to keep up with Goggins? Goggins followed Itzler everywhere for the 31 days of training, including the office. One afternoon while in the office, Goggins tells Itzler it’s time for a burpee test. If you haven’t done a burpee before, don’t worry you don’t need any weights. You simply drop to the floor in a plank position, do a push-up, kick your knees to your chest and jump into a jumping jack. It works out your arms, chest, legs and abs. Aim to get under 10 minutes. Stay tuned to for my score. Do 5 pull-ups (nickels) and then 10 push-ups (dimes) every minute on the minute. So if you do the 5 pull-ups and 10 push-ups in 30 seconds, you get a 30 second rest. If it takes you 50 seconds to do the set, you only get a 10 second rest. Do this for 10 minutes. Total will be: 50 pull-ups and 100 push-ups. By the time Itzler got to 4 minutes, he dropped to the ground and couldn’t do anymore. Can you do the full 10 minutes? Goggins apparently made friends with a guy at Itzler’s gym and he lent Goggins a 50-pound weight vest. So of course, Goggins wants to put it to use, and they do. Do 15 sets of 10 push-ups, with 30-seconds of rest between sets. Total: 150 push-ups with weighted vest. Instead of doing the typical 6 miles run, Goggins makes Itzler do 25 push-ups every half mile. Also, each mile time must be faster than the last. Start at a 9 minute-mile pace. After running half a mile, drop down and do 25 push-ups. After 1 mile, do 25 push-ups and run the next mile at an 8:50 mile pace. Repeat push-ups at every half mile and by the last mile you run should be at an 8:10 mile pace. Total: 6 miles and 300 push-ups. Run 4 miles every 4 hours for 48 hours. A total of 48 miles in two days. Goggins had Itzler train for this by running 4.25 miles four times in 24 hours. Since Itzler was running in the cold (about 10º F), he ended up pulling his groin about 16 miles in and had to cut the run short. Someone correct me if I’m wrong, but I think Goggins had to leave before they did the actual 4/4/48 run. Maybe I’ll try it (Leave a comment below and if enough people show interest, I’ll give it a shot). 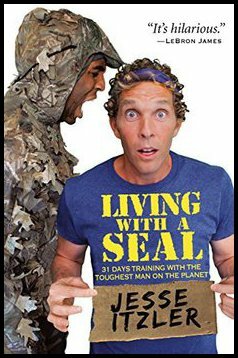 You can buy the book, “Living with a SEAL” by Jesse Itzler here. Follow Jesse Itzler on Twitter or Instagram. Follow David Goggins on Twitter or Instagram. Get David Goggins’ book, “Can’t Hurt Me” here. For literally a few dollar a book will give you an enormous amount of valuable information that can help you in life. It’s practically highway-robbery. So take advantage of this and read as much as you can.